This book is joyfully dedicated to the Christ and the Spiritual Hierarchy of our planet Earth, with gratitude for the generous help They beam to all disciples as we seek to transmit Their energies to a needy humanity. These articles first appeared in Share International magazine between February 1982 and December 1987. Biblical quotations are taken from the Revised Standard version unless otherwise indicated. Howard Ray Carey is that unusual combination: a Methodist minister who is also a student of the esoteric teachings, and so can shine the revealing light of the esoteric tradition on the symbolic stories and events of the Christian Bible. His is thus a most valuable service. We have been privileged to publish these articles in the monthly magazine Share International, where they have rightly proved enormously informative and inspiring. We are glad to have the opportunity of presenting them in this collected form. The Great Invocation, used by the Christ for the first time in June 1945, was released by him to humanity to enable man himself to invoke the energies which would change our world, and make possible the return of the Christ and Hierarchy. This is not the form of it used by the Christ. He uses an ancient formula, seven mystic phrases long, in an ancient sacerdotal tongue. It has been translated (by Hierarchy) into terms which we can use and understand, and, translated into many languages, is used today in every country in the world. It can be made even more potent. Used in triangular formation it becomes very potent. If you wish to work this way, arrange with two friends to use the Invocation, aloud, daily. You need not be in the same town, or country, or say it at the same time of day. Simply say it when convenient for each one, and, linking-up mentally with the two other members, visualize a triangle of white light circulating above your heads and see it linked to a network of such triangles covering the world. This book by the late Rev. 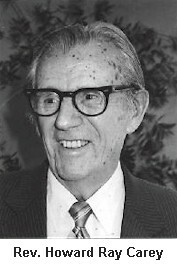 Howard Ray Carey was published by Share International Foundation in 1988. It is not currently available in hard copy form. Copyright © Share International Foundation.